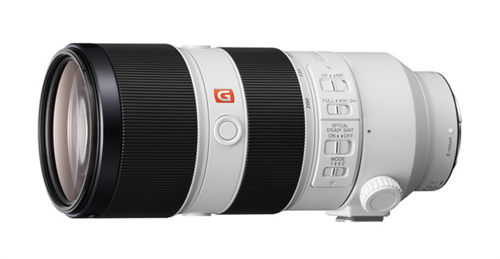 A popular telephoto zoom focal length featuring a bright constant maximum aperture, the FE 70-200mm f/2.8 GM OSS from Sony covers portrait-length to telephoto perspectives and is designed for E-mount mirrorless cameras. Characterized by both its fast f/2.8 maximum aperture and inclusion of OSS (Optical SteadyShot) image stabilization, this lens is ideally-suited for handheld shooting of distant and fast-moving subjects. Equally refined, the optical design incorporates a trio of aspherical elements, including one XA (extreme aspherical) element, and six extra-low dispersion elements to minimize spherical and chromatic aberrations throughout the zoom range. A Nano AR Coating has been applied to lens elements to reduce flare and ghosting and the front element also features a fluorine coating to guard against smudges and markings from adhering to the glass surface. 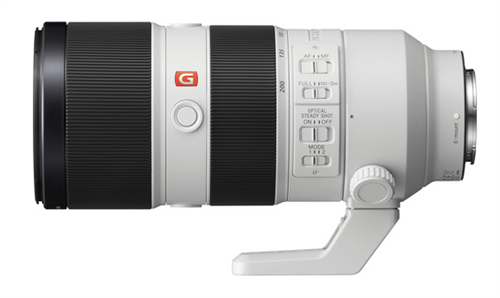 Pairing a versatile reach and sophisticated design, this professional-quality telephoto zoom is well-suited for a variety of working conditions. Benefitting performance is an apt autofocus system comprised of a dual linear motor actuator to drive the rear groups and an SSM (Super Sonic wave Motor) system to control the front groups for quick, precise, and quiet AF control. Further complementing handling and focus is a dedicated focus hold button, focus range limiter, and an AF/MF switch, and the included tripod collar has a rotating design for easier switching between horizontal and vertical shooting orientations. Additionally, the lens sports a dust- and moisture-resistant design for use in trying environmental conditions. 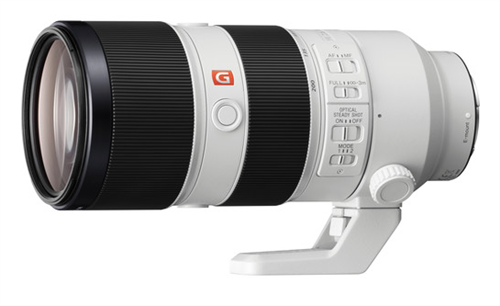 As part of Sony's esteemed G Master series, this lens is designed to achieve notably high resolution and sharpness through the correction of a wide variety of spherical and chromatic aberrations. Additionally, these lenses feature robust and intuitive-to-handle physical designs to benefit both photography and cine applications. A popular telephoto zoom designed for full-frame E-mount mirrorless cameras, this 70-200mm lens is also compatible with APS-C models where it provides a 105-300mm equivalent focal length range. A constant f/2.8 maximum aperture offers consistent performance throughout the zoom range and also lends greater control over focus position for shallow depth of field techniques. Of the three aspherical elements incorporated in the lens design, one is an XA element with superior surface precision to effectively reduce astigmatism, field curvature, coma, and other monochromatic aberrations from imagery. Four extra-low dispersion elements and two Super ED elements are featured in the lens design, too, and help to control chromatic aberrations and reduce color fringing for increased clarity and color fidelity. A Nano AR Coating has been applied to reduce surface reflections, flare, and ghosting for increased contrast and color rendering in strong lighting conditions. The front lens element features a fluorine coating to protect against smudges and dust from adhering to the glass surface. A rounded 11-blade diaphragm contributes to a pleasing bokeh quality when employing selective focus techniques. Optical SteadyShot image stabilization helps to minimize the appearance of camera shake for sharper imagery when shooting handheld with slower shutter speeds. This stabilization system can also be combined with select camera's sensor-shift type image stabilization for more effective control of camera blur. An OSS Mode switch lets you choose Mode 1 for general image stabilization that is suited to most types of shooting as well as a Mode 2 setting that is specifically intended to be used with panning movements. A linear SSM system and internal focus mechanism provides quick, quiet, and precise autofocus performance and also contributes to more natural, intuitive manual focus control. A floating elements system benefits image quality when working at the 3.15' minimum focusing distance with 0.25x magnification. Dust- and moisture-sealed design better permits working in inclement conditions. Removable rotating tripod collar permits quick switching from horizontal to vertical shooting orientations. Focus range limiter and focus hold controls offer more intuitive handling and faster performance when photographing moving subjects.